The AnaSondeTM family of digital radiosondes has been developed as a low-cost, user-friendly means of gathering scientific measurements in the lower atmosphere up to altitudes of approximately 30,000 feet. AnaSondes feature a modular sensor suite that can be customized by the user, including simple interfaces for user-added sensors. Digital data is encoded as hexadecimal values for transmission to the ground as either a series of tones or Morse code. Presently, all AnaSondes operate in the 70-cm amateur radio band, and an amateur radio license is required to use them. AnaSonde signals are received using inexpensive amateur radio receivers. The AnaSonde-E represents the most economical variant of the AnaSonde family. This radiosonde features two 10-bit analog-to-digital converter channels with 0-5 volt DC inputs (referenced to the regulated 5 volt supply voltage) and one frequency-counting channel which measures frequencies up to 25 kHz with 1 Hz resolution. A 10 milliwatt AM transmitter at approximately 434 MHz transmits data at regular intervals. With pressure and temperature sensors (as pictured on the right), it has a mass of 13.1 grams. The circuit board is 0.85 x 2.5 inches. The AnaSonde-E can be configured to transmit its measurements entirely via Morse code. Users with Morse code skills can receive telemetry by ear! Alternatively, a shareware program can be downloaded to decode the transmissions. A companion piece of software developed by Anasphere allows the user to seamlessly process the data as it is received. However, users will find that decoding by ear will yield the best results for long range work - this can lead to a fun contest for your ham radio club! Items Supplied With Each AnaSonde-E. The AnaSonde-E can be ordered as a kit or pre-assembled. Every AnaSonde comes complete with everything needed for flight except for a 9-volt battery and helium for the provided balloon. 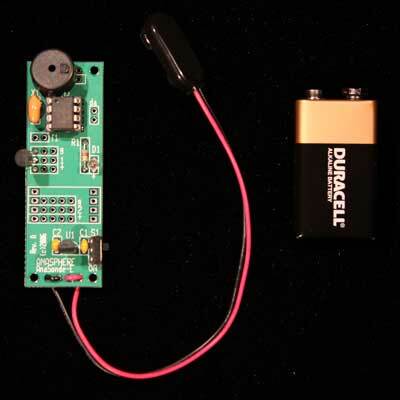 Sensors specified by the user are included with the kit. Pressure, temperature, and humidity sensors are all available as standard options; resistive sensors for specialized measurements are available from Anasphere as well. The frequency channel is useful for custom sensors which provide a frequency output. If you don't have such a sensor, you probably want Frequency 1 disabled. A small amount of resolution is lost if choosing the on-board processing option. Valid amateur radio call sign required for all AnaSondes and AnaSonde kits with radio transmitters.